Focusing on research, education and tourism, this carefully crafted garden park enclosed with netted canopies is home to a mere five hundred butterflies. But the small size actually works in its favour. There is not much to see here other than pretty winged insects fluttering from flower to flower, and the quick walk through makes the experience quite engaging. Fish filled ponds and manmade waterfalls just help to improve the charming atmosphere. There is also a nursery, a room with hundreds of pupa/chrysalis hanging on display. Also check out the museum, restaurant and gift shop. Take a taxi, bus or ojek to here. How popular is Kemenuh Butterfly Park? People normally club together Geger Sawangan Beach and Pura Ulun Siwi while planning their visit to Kemenuh Butterfly Park. We were pleasantly surprised. Very beautiful and butterflies of all kinds everywhere. Small but we'll kept paths that create a very cozy feeling. Fun for kids aswell. Takes about 30 minutes to walk through. There's a butterfly kindergarten at the end where you can hold big moths in your hands. And a gift shop and restaurant at the exit/entrance. Well worth a short stop! A lovely place to visit. There are a lot of beautiful butterflies flying around. It is quite small so I wouldn’t suggest going out of your way to visit this alone, but if you’re doing other activities nearby or passing by, it’s definitely worth a visit. Entry price is IDR 100,000 per person. Really beautiful place and a lot of butterflies. Nothing I've never seen before. You also get a chance to hold butterflies and moths. Takes also card but with 2% fee. Worth visiting. Yes, it had so many butterflies. My girls really enjoyed it. The explanation of the process was good. The restaurant took a while to serve the food though. 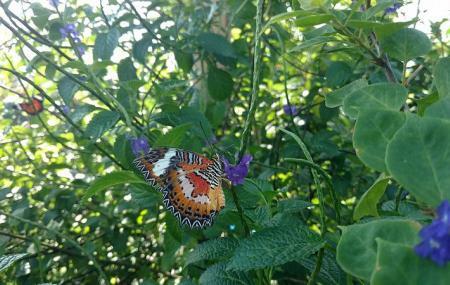 Kemenuh Butterfly Park has some collections of the Butterfly type. At this place also has detail information about Butterfly and their life cycle. Good place to educate our self and our kids and family about Butterfly. The place and the butterfly are very beautiful.